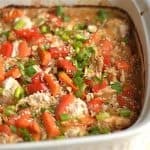 Peanut Chicken and Quinoa Bake is a one-pan, super easy dish that makes a great weeknight meal the whole family will enjoy! Don’t be mad at me guys, I gave my slow cooker a break this week. Not on purpose of course, but the timing of my week has been really wacky. I wasn’t around at all in the afternoons to throw anything into my crockpot. I needed meals that I could prep in the morning, and start around 5pm. So I’m sorry slow cooker, the job description just didn’t fit. 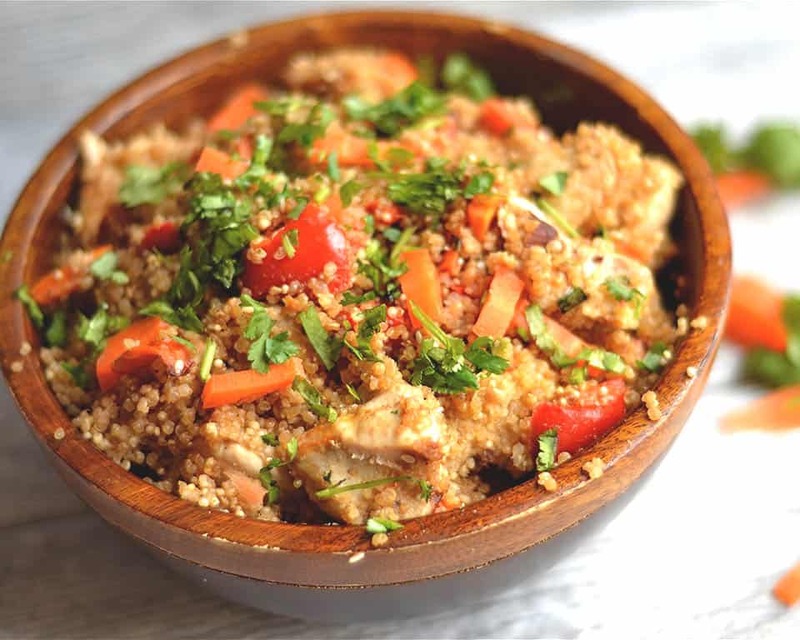 I had this idea of a Peanut Chicken Quinoa dish for awhile, and my original idea was to try it out in the slow cooker. 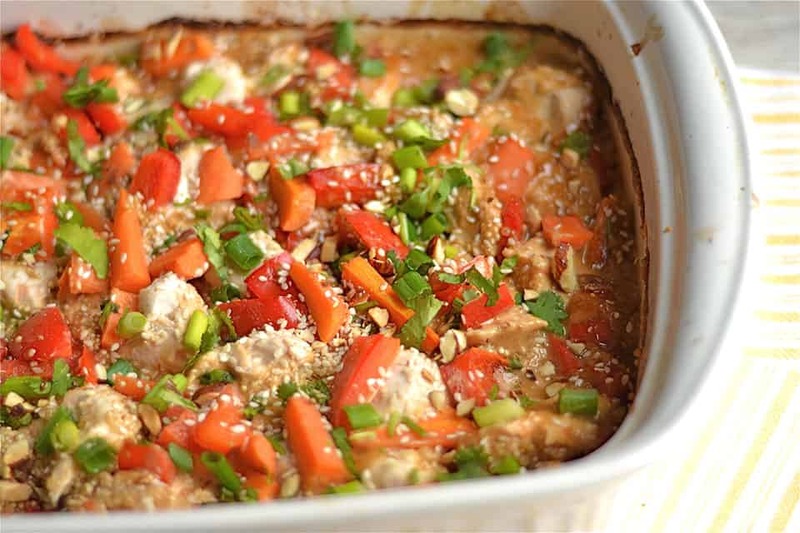 But after having success with Fit Foodie Find’s Cashew Chicken, I loved the way this casserole/bake/one-pan dinner came out and wanted to make one of my own in the oven!! What I love about this dish, are many things. 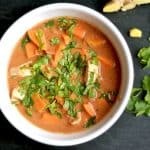 Starting with the peanut sauce: a definite favorite with my kids and husband!! They never, ever, ever complain about anything with peanut sauce. It’s also one of the only dressings they love on their salad. I also packed the dish with protein and fiber by adding in quinoa. 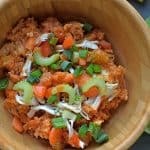 Finally, I tossed in my kids’ favorite veggies: bell pepper and carrots. Feel free to adapt here! Broccoli, maybe even asparagus or edamame would also be a great fit. Finally, this dish was so easy. It was basically as easy as the slow cooker. So I hope that means your totally on board now. I hope you enjoy it as much as us! Another fun tip is that I prepped this in the morning and refrigerated the dish. I was able to just throw it right in the oven as soon as I got home for a simple dinner. Preheat your oven to 375 degrees. Lightly grease a 9x13 casserole dish and set aside. Chop the chicken into small chunks (about 1 inch). Set aside. 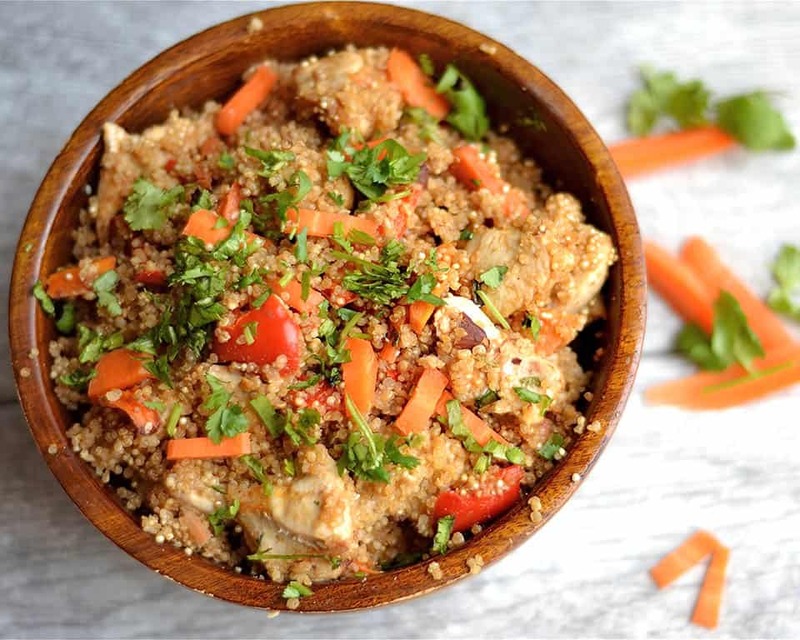 Line the casserole dish with quinoa seeds, top with chicken and chopped vegetables. In a blender or food processor, place peanut butter, vinegar, soy sauce, oils, honey, ginger, and garlic. Blend until smooth. Measure out 1 cup sauce, and mix together with 1 cup broth in a bowl. 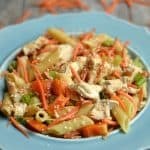 Pour broth/sauce mixture over chicken and vegetables. Bake for 50-55 minutes, or until quinoa looks cooked. Remove from oven and let sit for another 10 minutes. This recipe can be made ahead earlier in the day, and baked at your convenience. Did you leave out the cup of broth on the ingredient list? 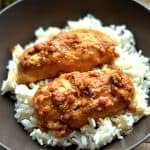 Want to try this, but want to get it right! Oh my gosh, thank you!! Yes, I just fixed it 🙂 I try not to make these types of mistakes, but so thankful when they get pointed out! Thanks Dahn! Hope you enjoy it!